Recreatinghow the seeds of life might have survived aboard an ancient meteorite thatcrashed to Earth is no small feat, but scientists have begun doing just that ina recent lab experiment. The project could help indicate whether life on Earthgot its start from alien organic material that hitched a ride aboard spacerocks. Perhapsone of the likeliest building blocks of primordial life on Earth came in theform of aminoacids, which are the basic components of proteins. And so a team of U.S.and European researchers focused on trying to replicate how well amino acids wouldfare when a meteorite slams into the ground. "Thisstudy is the first which tested amino acid quantities similar to those found inreal meteorites," said Marylene Bertrand, a biophysicist funded by theNational Center for Scientific Research (CNRS) in France and lead author of thework published in the December issue of the journal Astrobiology. Morethan 70 different amino acids have been found in meteoritesthat fell to Earth. Past studies have tested the survivability of many aminoacids, but did not try to replicate the concentrations of organic moleculesfound in actual meteorites. Bertrand'sgroup also took the new step of testing the amino acids embedded insidesaponite, a clay material found in carbonaceous chondrite meteorites thatrepresents a possible signature of water. Simulatinga meteorite impact involved firing cylindrical plugs from a 20 mm gun at atarget holding the amino acid-saponite samples in place. 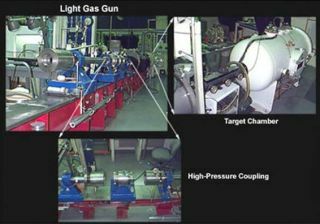 Researchers fired thegun inside a vacuum chamber to allow the projectiles to strike the samples atthe highest possible speed, and tested a range of low to high impact pressures. "Itis easier to launch a projectile than to launch the samples," Bertrandtold Astrobiology Magazine, and noted that the resulting shock from hittingthe samples with a projectile was the same as if the team had shot the samplesout of the gun. Thetoughest amino acid survivors, including the smallest amino acid glycine,turned out to have a molecular alkyl side chain. A second group of amino acidswith structures that include a functional side chain and dipeptide proved lessresistant, and failed to survive the highest impact pressures. Afailure of many amino acids in the experiment to resist higher shocks seemspuzzling, because many of the same amino acids appear to have survived inmeteorites. Bertrand's group suggested that the samples containing the aminoacids could not expand inside the metal target containers, causing them to endurehigher pressures and temperatures than what they would have experienced inside fallingmeteorites. Also,amino acids may have been better able to survive the shock of impact if theyarrived on Earth billions of years ago, when the atmosphere was more dense andwas mainly comprised of nitrogen, carbon dioxide, and methane. "Theatmosphere was very different in primitive Earth and the conditions and effectsof the impacts on organic matter could have been very different than now,"Bertrand explained. Aminoacids also might evaporate upon impact and then eventually condense once moreinside meteorites, the team noted. Or larger organic compounds could have beendestroyed by the impact shock and broke apart into amino acids. Suchstudies raise plenty of new questions to join the unknowns already swirlingaround the puzzle of how lifeon Earth first arose. For instance, scientists still do not know the rateof meteorites that fell at low or medium velocities, which would have madesurvival more likely for amino acids and other organic molecules. Still,they know that roughly 20,000 tons of meteorites and other space particles fallto Earth each year. Any organic-bearing rocks could have made a big differenceduring the first 500 million years of the Earth's existence as a planet. "Ithink that all organic matter present on Earth in living organisms could comefrom the meteorites, micrometeorites or [interplanetary dust particles],"Bertrand said. "The major question now is how the organic matter couldhave been processed and organized to lead to living organisms." Scientistsagree that life somehow emerged from Earth's water around four billion yearsago, and also agree that such organisms mainly consisted of liquid water andorganic molecules. But they still debate whether the organic building blocksarose from the Sun's radiation, providing energy for the early ocean "soup,"or whether undersea hydrothermalvents provided the necessary biochemistry touch. Ifmeteorites provided a third way by bringing life's ingredients to Earth, thentheir precious organic cargo must have somehow survived an even more dauntingprospect than impact — the long journey through space. Bertrand'sgroup also wants to check out the effects of space conditions on organicmolecules. They have already conducted experiments that exposed amino acids toultraviolet light in the harsh vacuum outside the International Space Station,as well as in lab settings on Earth.